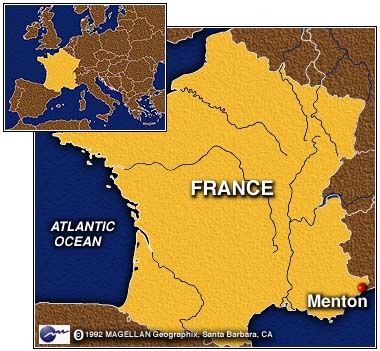 “Just back from a week in the South of France, staying in Menton, a Riviera Town a few kilometres from the Italian border. On our first afternoon there Beverley and I decided to see if we could walk into Italy. We could. Actually it’s dead easy, although it seemed a bit intimidating walking past armed gendarmes standing a few feet away from equally tooled up Carabanieri, but we strolled by unsolicited, neither side asking to see our passports, which we didn’t have. A hundred yards or so in we saw a few banners and a collection of tents and realised we had stumbled across a migrant camp. Thus was explained the tooled up border guards. We could not just walk by, or take photos as if it was just another tourist attraction, so we entered the camp and made ourselves known. A young Italian lad who spoke good English was brought to us and explained the situation, the migrants, I use that term, on his insistence as he refused to call them refugees simply because they were being denied that status, had arrived in July, mainly Sudanese and Eritrean with some Syrians. They had landed on the rocks that line the coast and been left there with nothing, simply sleeping in the clothes they wore. The young man and others from an anarchist group had gone to support them and had stayed there since, being joined by other volunteers of differing political persuasions. Our first thought was on how well the camp was run and organised. This was nothing like the scenes of Calais assaulting our senses daily, courtesy of our wonderful media. It was as clean as it could possibly be and well laid out and structured. A couple of young migrants kicked a ball about, obviously glad to just be alive. Our interpreter explained that the camp was run as a collective with all decisions being made by meetings of both volunteers and migrants. No sense of a threatening atmosphere at all. We explained that we were socialists and trade unionists from Britain and told him about the 100,000 demonstrating in London in support of refugees, something about which he knew nothing but promised to share the news with the camp. During all this I was almost overwhelmed with the sense of humanity within the camp and the fact that people were gladly giving up their time to help those less fortunate. I have wasted far too much political energy on organisations that want to ‘talk about it’ but do little else, here were people, mainly young, actually doing something about it! I have to admit I walked out of that camp emotionally shaken and glad my eyes were covered by sunglasses. 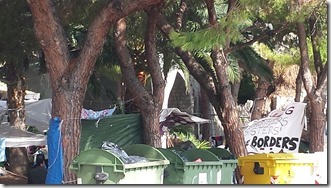 On our last day we visited again, we had some holiday euros left so made another donation. This time we spent more time, talking and listening. One of our young interpreters knew about our strike and had seen the film Pride, she told us that at its peak the camp had housed almost 2000 desperate people and had originally started purely as a protest against the refusal of the French government, that had exploited countries around the globe, to allow these people access. 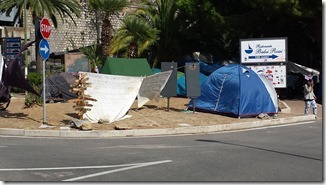 I shudder to think what would have happened had the camp not been formed. Most impressive was to see 40 or so migrants in a lesson, learning French, all paying strict attention to a young woman whose only technical aid was a flip chart. We were allowed to take photos but strictly no faces as these people face repression if identified, both in their country of origin and any country they might reach. Determined that our last visit would not be the end of it, this time we took contact details in order to raise their plight upon return. This is their Facebook page, please ‘like’ it and show support – Presidio-Permanente-No-Border-Ventimiglia. We intend to raise support for them here, details will follow. I cannot help but remember the tremendous solidarity shown to my union, the National Union of Mineworkers, which sustained us through that fateful year. In the name of humanity if we can do just a little of that to aid people who literally have nothing then we can show some of that solidarity. 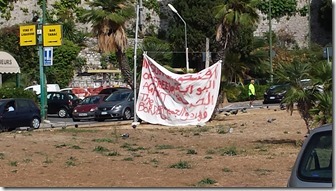 One of the banners said simply that they could not go back because they have lost everything! Please take note of that anyone who thinks we should not help! I would never have imagined, when planning the holiday that my belief in humankind would be reinforced by being humbled, and seeing, even in the most desperate circumstances, humanity and compassion expressed so vividly. The irony is that whilst we could stroll between borders without challenge, human beings fleeing war, torture and starvation are left to rot in a no man’s land. South Yorkshire people are showing that we are part of the growing Europe-wide movement to welcome refugees. A demonstration organised at short notice drew over 100 people from different communities together to say “Refugees are Welcome Here”. 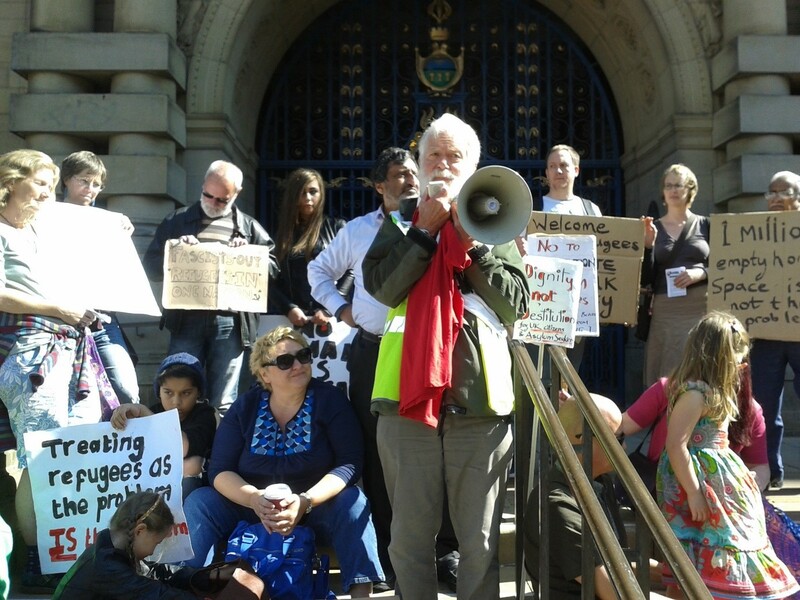 The weekend after 150 people gathered outside Sheffield Town Hall at the same time as a massive protest in London and local events in Doncaster and Barnsley (pictured above). 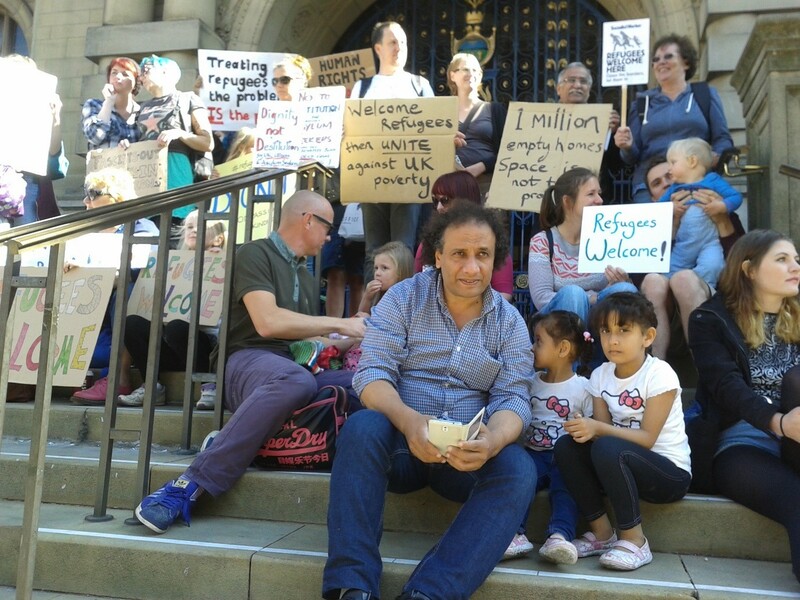 The demonstration outside Sheffield Town Hall heard from refugees themselves and from people who had organised support for Syrian refugees. A video and short report from the Sheffield Star is here. 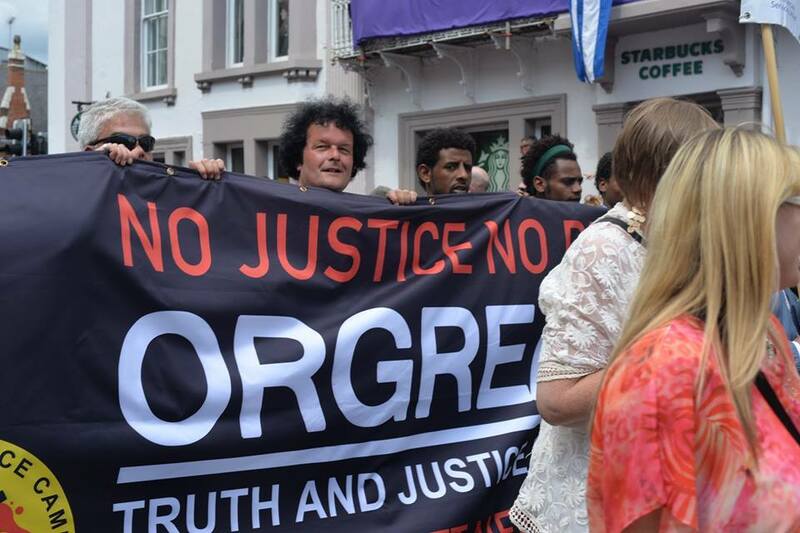 More pictures of the Sheffield protest are below (thanks to Manuch). We know that, particularly in South Yorkshire, there has always been humanity and solidarity shown to people migrating here. But in the last week or so something has changed. 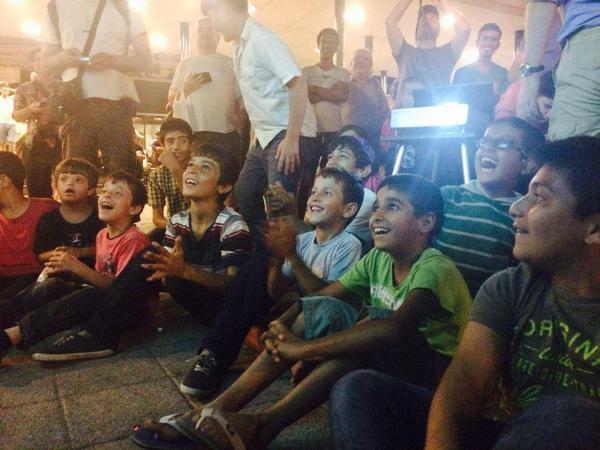 It wasn’t just the picture of Aylan Kurdi drowned on the Turkish beach: there has been an unstoppable movement of desperate and determined refugees demanding safety all over Europe. It has become impossible to ignore. Riot police and sniffer dogs in Calais, razor fences in Hungary and the UK Government’s “Let Them Drown” policy have not stopped refugees moving to safety.